Straps, Braces, and Tape: Should I wear them? Home › Injured? › Sports Medicine Corner › Straps, Braces, and Tape: Should I wear them? Have you had a sore, achy knee throughout your summer training? As many people begin their countdowns to their goal races this Fall, the question of whether or not a brace, strap, or tape will help get them through their race seems to pop up. In certain cases, a supportive device may be beneficial. It depends on what the diagnosis is, what’s causing it, how much pain you’re in, and how much you are compensating for your current injury. There are a variety of braces, straps, and tape on the market. They each function a little differently and some are more appropriate for specific conditions than others. Today, the focus will be on common knee conditions and how supportive devices may help. Before we start talking about braces, it is important to acknowledge that they do not cure an injury, they simply offer support to the involved joints and muscles. If the only thing you are doing to address the discomfort you are experiencing is wearing a brace, you are missing a huge part of the equation towards actually getting rid of your injury! These band-like devices wrap around the bottom of the knee (sometimes above the knee) and apply pressure to the tendon. The major function of them is to help spread pressure across a larger area and take stress off of the sore area of the patellar tendon (tendon on the bottom of the knee). 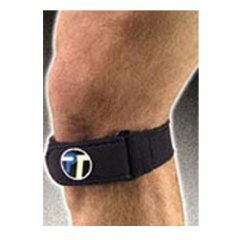 When placed above the knee, they function to help reduce stress on the area where the IT Band tends to get tight and create friction around the knee. Another added benefit to a strap is its proprioceptive effect on the knee joint. It provides feedback to the brain to help keep the muscles that support the knee on a heightened level of alert. The conditions that straps are most commonly used for are patellar tendonitis, runner’s knee, chondromalacia, patellofemoral pain syndrome, and IT Band friction syndrome. There are many different braces on the market. Some are used post-operatively to prohibit certain dangerous motions while the patient is recovering. Some braces are used prophylactically to help prevent injury (think of those big knee braces on football linemen) and others are used for support and increased comfort while performing activity. Sometimes, choosing a knee brace can be a little overwhelming. There are braces with holes in them, no holes, metal hinges, gel pads, some with straps, and some without! The two most common are the knee sleeve (no holes) and the patella brace (sleeve with a hole in it). The knee sleeve serves two major purposes. The first is that it provides compression (if it’s made of compressive material). This is helpful to manage mild swelling around the knee and keep blood flowing to the muscles that support the knee (quadriceps). It also provides a significant amount of proprioceptive feedback to the brain, helping to keep the body at a heightened level of awareness that the knee might need a little extra help. 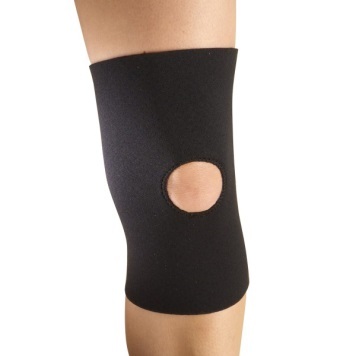 The patella brace, or any knee sleeve with a hole in it, is designed to support the kneecap. Certain conditions will cause the knee cap to track improperly, causing irritation around the knee joint. The hole in the brace will encompass the knee cap and help to keep it on track. 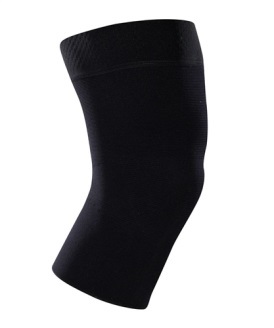 A compressive knee sleeve is most useful for conditions that might cause a mild amount of swelling around the knee, like a bruised knee or mild arthritis. It can also be used for runner’s knee or minor sprains. The patella brace is often recommended for chondromalacia, patellar hypermobility (loose knee caps), or post-surgically for return to activity. If you have been to a road race or watched the Olympics the past few years, you are familiar with the brightly colored elastic tape known as kinesiotape (K tape). K tape, which is very different from traditional athletic tape, is designed to mimic the elasticity of human skin and allow full range of motion while still providing its therapeutic benefits. Originally developed in Japan, K tape lifts the skin, enhancing function of the muscles, joints, fascia, and lymphatic system. Depending on how it is applied, it can act to inhibit overactive muscles, facilitate contraction of underactive muscles, reduce swelling, provide support, or enhance proprioception. There are many websites and tutorials that instruct on application of K tape. However, since the proper application of the tape depends on the injury, the cause, and what you are trying to achieve with the tape, it is best if you can have a trained healthcare professional help you. You might be wondering what all the colors are about? Do they really mean anything or do you just pick the color that matches your race outfit? In Japan, the tape started with two colors, red and blue. The red (hot) tape was used where heating effects were desired and the blue (cold) tape was used where cooling effects were desired. Now, since the post-Olympic K tape marketing boom, the colors don’t mean anything. So go ahead and choose your favorite! K tape can be used to help treat a wide variety of orthopedic conditions. Most commonly, runners will use the tape for IT band friction syndrome and runner’s knee. The fact that the tape moves naturally with the skin and remains adhesive for a few days through sweat and showers make K tape a popular choice for runners. As you can see, there are a lot of options for supportive devices. The advice that I give achy runners as they approach the final weeks of their training is to use them as a last resort. Appropriate rest, ice / heat, massage / mobilization, stretching, and exercise are the best treatments for a running injury. If all of these steps have been taken and you are still looking for a little something extra to help you cross the finish line, then I would recommend trying a strap, brace, or tape.